Put a pan of water on to boil and add a pinch of sea salt and a splash of vinegar. Heat a medium frying pan to high and add a little oil. Pull the skin off your black pudding, then crumble it into the pan. When it starts to crisp, pop your bread in the toaster. When the pudding looks and tastes done spoon it onto kitchen paper to drain while you poach your eggs. Stir the boiling water to create a motion that will help the egg white wrap around neatly. Crack in the eggs. They will cook in a few minutes, depending on how you like them. Butter your toast then smear it with a thin layer of Marmite or Vegemite. Cut each slice into soldiers. 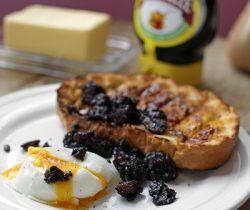 Serve a poached egg next to the toast, sprinkle over the black pudding and dig in.